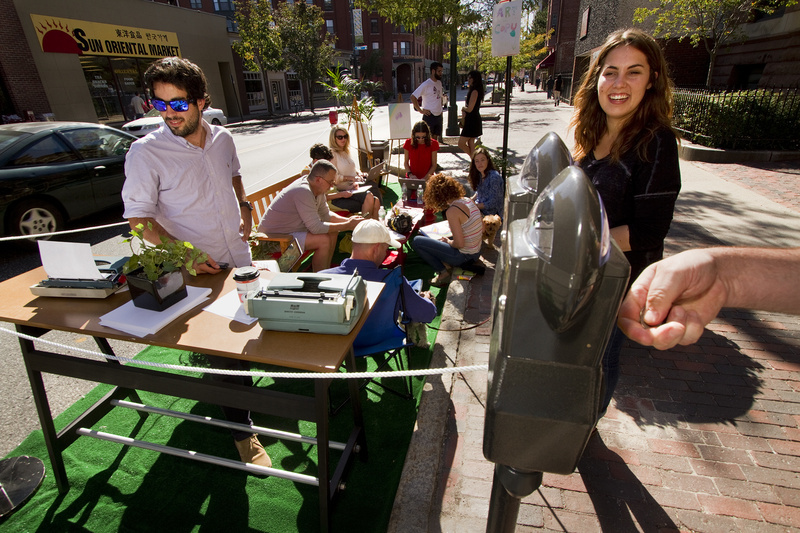 People and groups stake out some asphalt as they transform parking spots into creative spaces for the city's second Park(ing) Day. 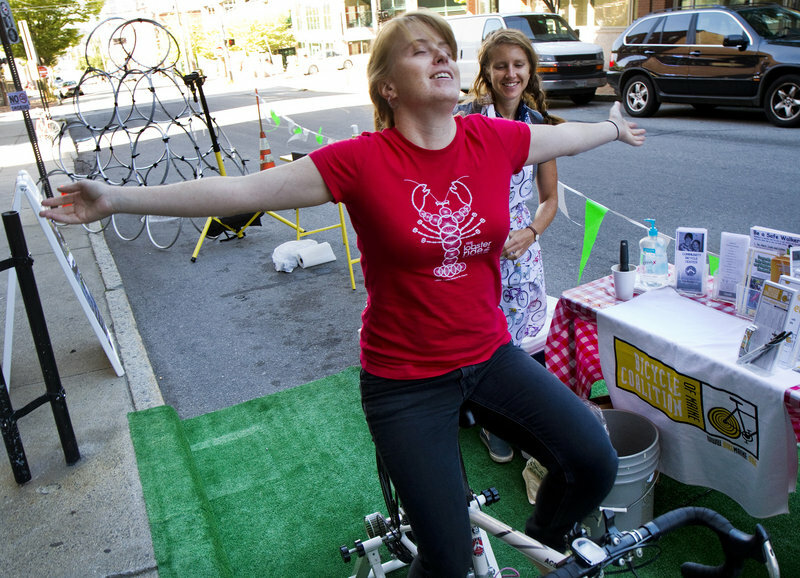 Elizabeth Hall of the Bicycle Coalition of Maine enjoys a peddle in a parking space outside the organization's Preble Street office, during Portland's second annual Park(ing) Day on Friday, September 20, 2013. Taking place in nearly 200 cities around the world, people take over parking spaces for to hang out and have fun. It happened throughout downtown Portland on Friday as parks the size of parking spaces popped up along streets for the city’s second Park(ing) Day. Smith sketched her portraits in a “parklet” created by The Art Department, a gallery and studio on Congress Street. It was one of eight such refuges set up in metered parking spots, part of a growing international event that encourages people to create a unique – albeit small – public space for a day. Created in 2005 in San Francisco, the annual appearance of temporary parks has transformed into a global event with park installations in 162 cities and 35 countries on six continents. The event made its debut in Portland last year, when six groups transformed parking spaces into shared public shapes. Each organization or business that participated paid the city $15 to reserve a parking spot for the day. 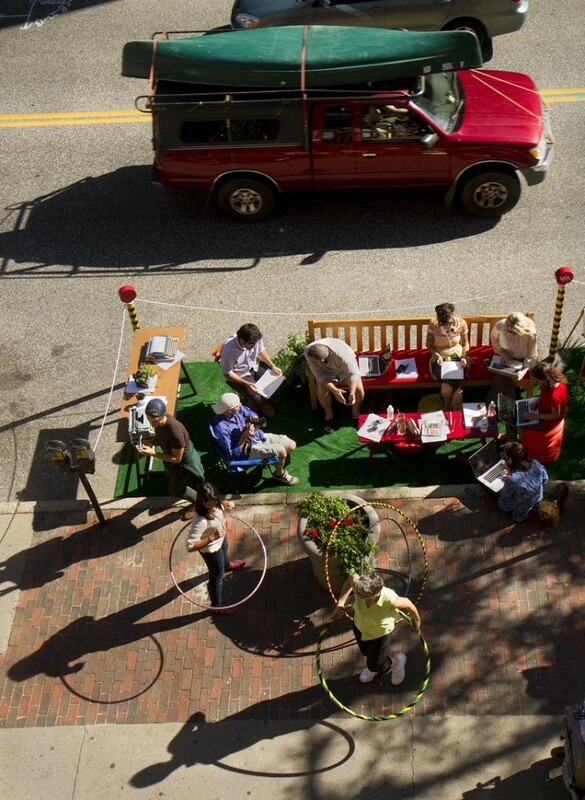 Beyond opening a dialogue about public space, Park(ing) Day also brings people together who might otherwise simply pass each other by, Schindler said. Deborah Gordon of Portland and her 3-year-old granddaughter, Sascha Wentworth, stopped by the park that the Bicycle Coalition of Maine created in two parking spots on Preble Street. 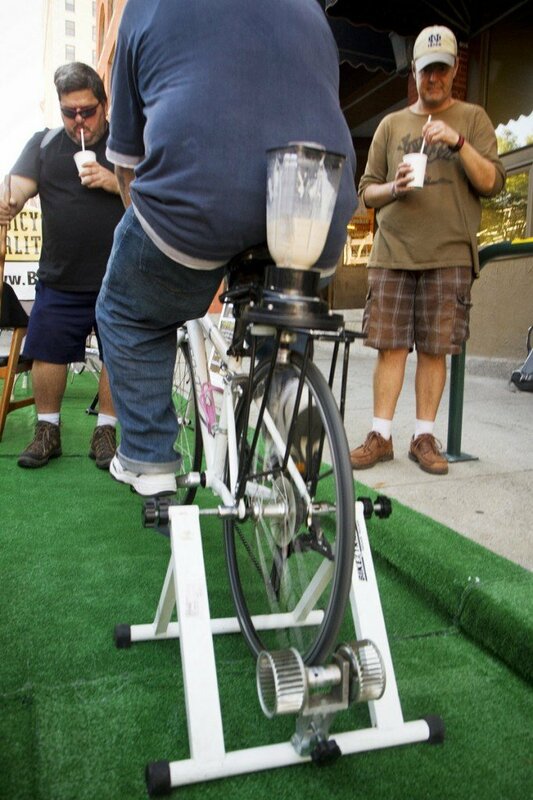 Using a bicycle-powered blender, they whipped up a pralines-and-cream milkshake with help from Abby King, community advocacy director for the coalition. “I think this idea is fabulous,” Gordon said before she and Sascha wandered off in search of other miniparks. King said the bicycle coalition jumped at the chance to create a park that included chairs, reading material, milkshakes and bicycle repairs. Sculptures by artist Fred Robie helped define the space. “It’s a really fun, engaging way for us to get people thinking about how we use our public spaces,” King said. Outside of VIA, a marketing and advertising agency on Congress Street, Liz McClellan pounded softly on a drum as she chatted with people sketching, painting and writing messages on typewriters. She said the “art and copy garden” the agency created in a single parking space was meant to draw people in to create works of art together. 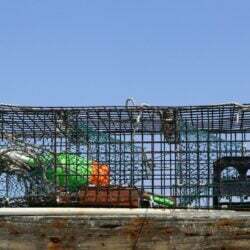 Beyond enjoying lounging in the sun, McLellan said she was happy to meet new people and see what they created. “Honestly, it’s great to have more contact with people who walk by,” she said.